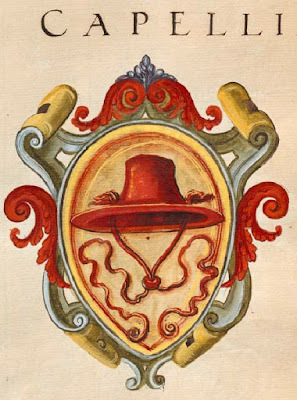 After running across the Boston Athletic Association's logo/arms/ crest/whatever the I posted last time, there's another coat of arms that's made the news recently. 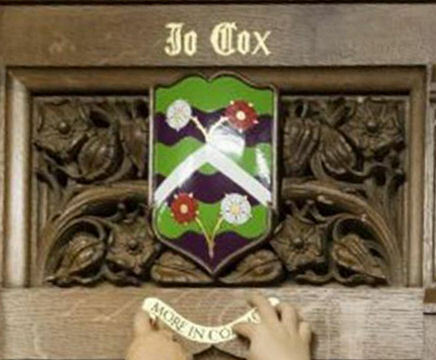 The "arms" of Jo Cox, the Member of Parliament who was murdered on June 16, 2016, have been erected in the House of Commons in her memory. MPs who are killed while in office are remembered in this way at Parliament. The arms are the result of a design by Garter Principal King of Arms taking into account the desires of the family, including the children. 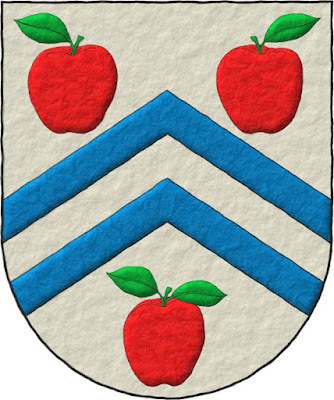 The arms were granted to her widower with authorization to display them on a monument to her memory. The barry wavy vert and sable is low contrast, and at any distance the two colors tend to look muddled. 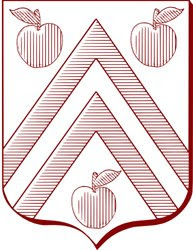 The chevron argent would look more balanced and more like an integral part of the design if it were wider. 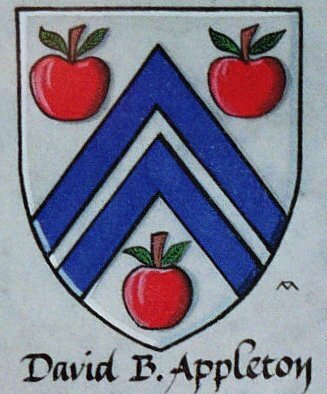 (As it stands, it is probably blazoned a chevronel, but a single diminutive of an ordinary seldom looks good on a shield.) Of the four roses (symbolizing her family members), the two red ones do not have good contrast with the field ("color on color"), being only helped by the seeding and barbing which is high contrast. I'm not at all sure why the roses are slipped ("stemmed") in pairs like this. 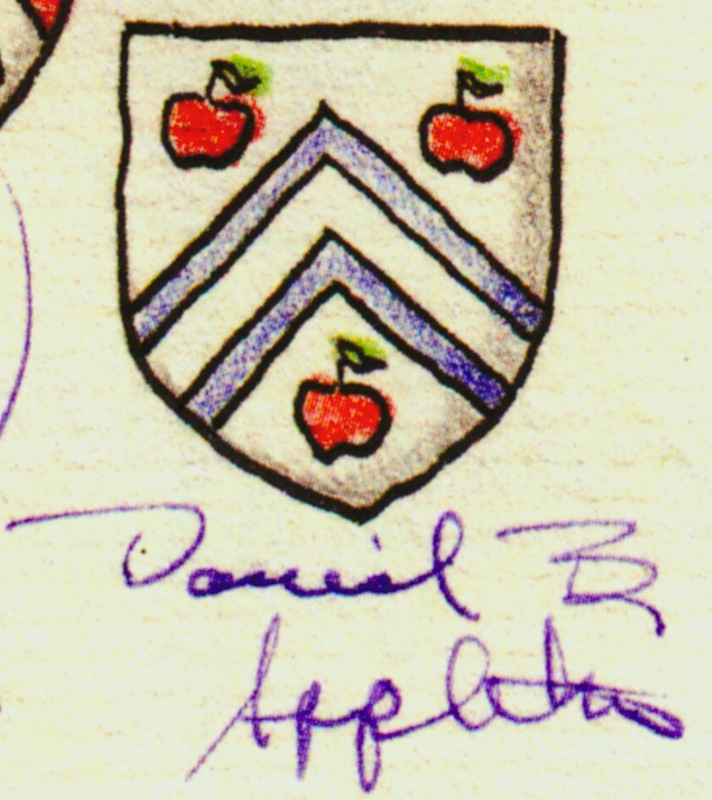 Were they left as just the blossoms, they could be arranged to better balance the shield, and would allow room for the chevron to assume its rightful size. Lest anyone think that all I am going to do here is carp about everything in the design, I have to say that I really like the motto, More In Common, which was inspired by her maiden speech as an MP, and which has several layers of meaning. It never really ceases to amaze me, that I seem to run across coats of arms and heraldic pieces wherever I go. Even when I'm just visiting a local antique store looking for something else entirely having no relationship at all to heraldry. The most recent example of this was last Friday, when my wife and I went to an antique shop because they were having a big sale and we're in the market for a nice painting or other piece of art to fill in the big blank area over the television. We've been looking for a little while now. We haven't found what we're looking for yet (though we have seen a couple that we rated as "almost, but not quite"), but we're pretty sure we'll know it when we see it. But while wandering about the place looking at paintings, etc., I saw this in a display case. It's a three-handled tankard with the arms/crest/logo of the Boston Athletic Association and the date 1887 on it. The BAA was established on March 15, 1887, and is one of the oldest athletic clubs in the country. It is probably best-known for its organization and sponsorship of the annual Boston Marathon beginning in 1897. The BAA's logo is a blue shield with a gold unicorn's head erased atop a torse. Above is the one found on the tankard, and below is the one that the BAA uses on its website today. 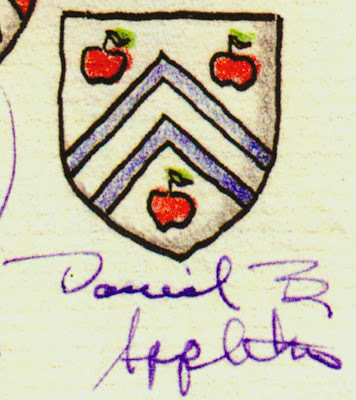 As an heraldic purist, that they put a crest on the shield irks me, but I don't think that the modern version is an improvement, having the unicorn's horn project outside the shield and with the "B.A.A." 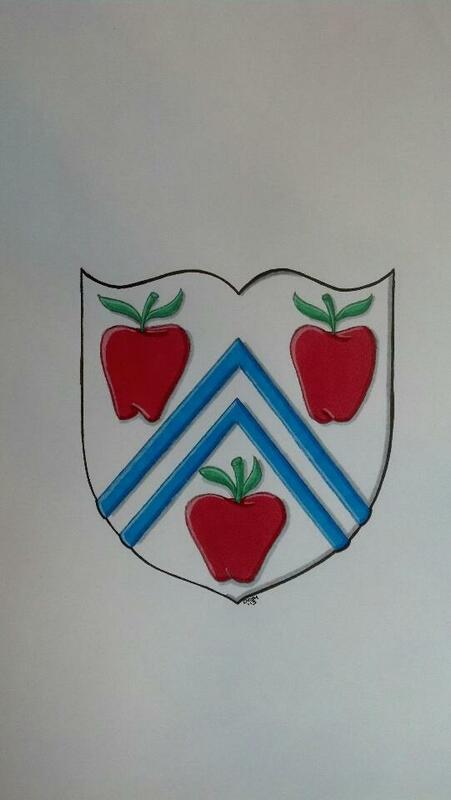 banner (which at most should be placed under the shield like a motto scroll) overlying the shield. Still, it's a comparatively simple design, and it uses a real unicorn's head and not just a horse's head with a horn attached to its forehead, so I think I'd give them reasonably high marks for the attempt at making it heraldic. 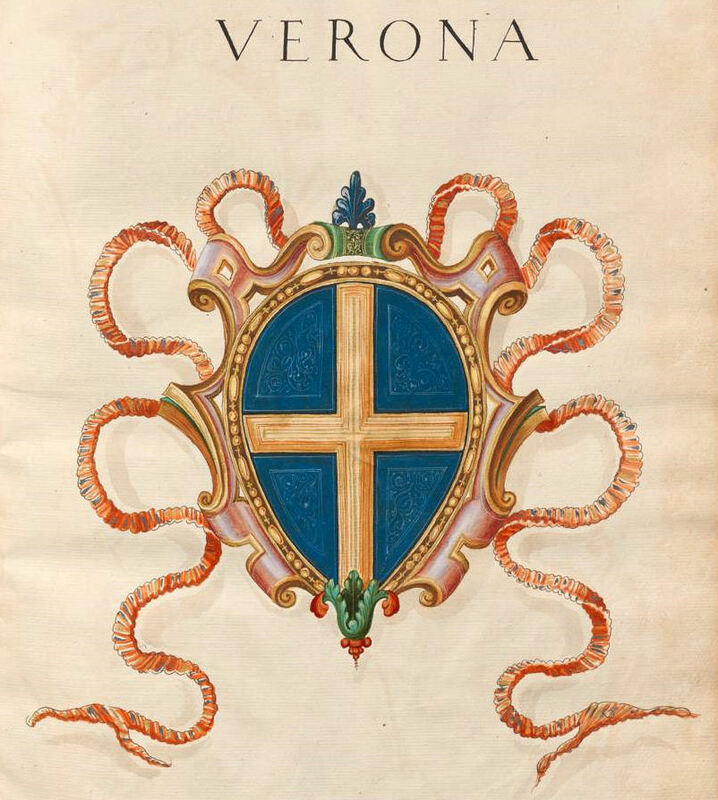 The concept isn't bad, but it ends up missing the "this is good heraldry" mark by a fair bit. Still, it was an interesting piece of heraldic art to run across while looking for something entirely different! Next stop on our tours around Glasgow was The Collection at the Burrell, some 9,000 objects of art from a wide variety of times and places, the compilation of collector Sir William Burrell and his wife Constance. One of the first things you see after entering the building is the very impressive 16th Century Hornby Arch, taken from Hornby Castle in Yorkshire, where it served as the main doorway. The Burrell Collection obtained it in 1930 when the estate was broken up and most of the house demolished. Hornby Castle was largely rebuilt in the late 15th and early 16th Centuries by William Conyers, first Baron Conyers, The house had earlier belonged to the St. Quintin family, until heiress Margaret Quintin married John Conyers. In the image above, you can see the name "Conyers" carved into the peak of the doorway arch below the arms. 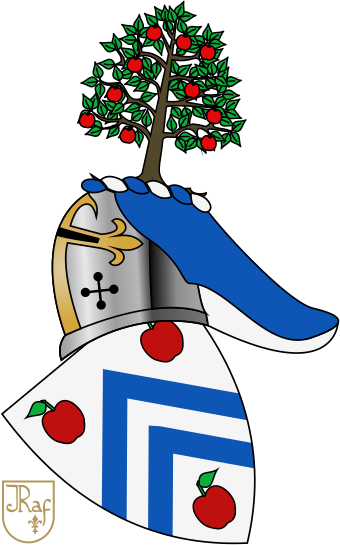 The paternal arms of the Conyers are given in Burke's General Armory as Azure a maunch or, which Baron Conyers of London and Hornby Castle differenced (per the 1568 Visitation of London*) with a crescent or surmounted by another gules in chief. In the carved depiction here (and you may have to click on the image to go to the larger version to see it) the crescent appears on the maunch itself rather than on the field in chief. I'm not certain that the lion rampant in the alcove above the arms is to be taken for the crest. If you look at the large picture of the Hornby Arch at the top, on the right is a crest, a bull's head. 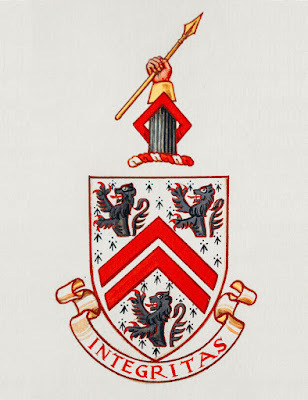 Burke, however, gives the crest of Conyers (of London and Hornby) as A sinister wing gules differenced with a crescent or surmounted by another gules. A different Conyers family (Conyers of Bowlby) used a bull's head with its neck pierced by an arrow as a crest, but not this family, at least that I have found. Anyway, I'm not entirely certain what the lion here represents. Additionally, at the top of the Arch on the left side, are two smaller shields, one with three escallops and one with three chaplets or laurel wreaths. I'm not certain who they represent; neither appears to be the arms of the St. Quintins. 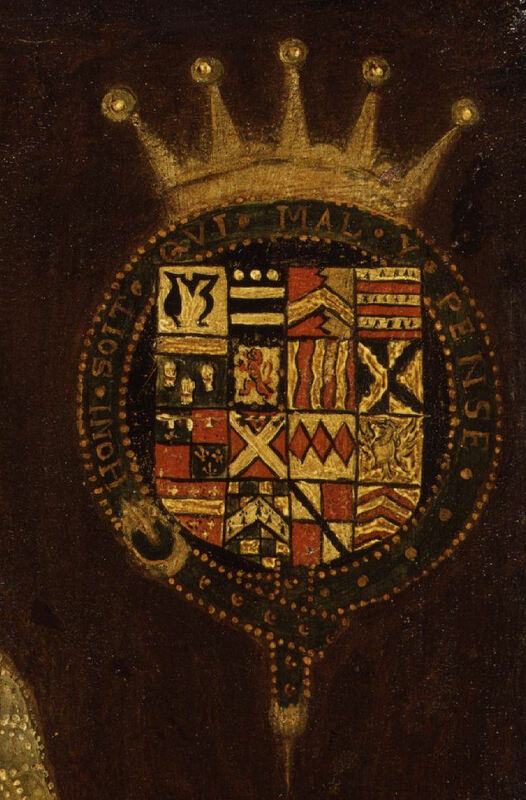 You may also notice the paternal arms of a maunch on a small escutcheon at the very top of the work, though I do not see any marks of difference on that shield. So although some of this display remains a bit of a mystery as far as the identification of all of the quarters, the rampant lion, and the two small shields go, what a grand entrance to a house. 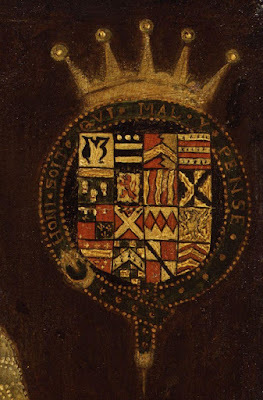 We should all be grateful that the Burrell Collection was able to acquire this piece of monumental heraldry when much of the house was demolished, thus preserving it for us to see and share! Just outside of Provand's Lorship in Glasgow is the St. Nicholas Garden, "created as part of a tourist and environmental initiative by the Glasgow Development Agency, Glasgow City Council, and Strathclyde Regional Council." It's a very pleasant garden, and around part of it beneath an arcade are a number carved stone figures, and among these are a few coats of arms. 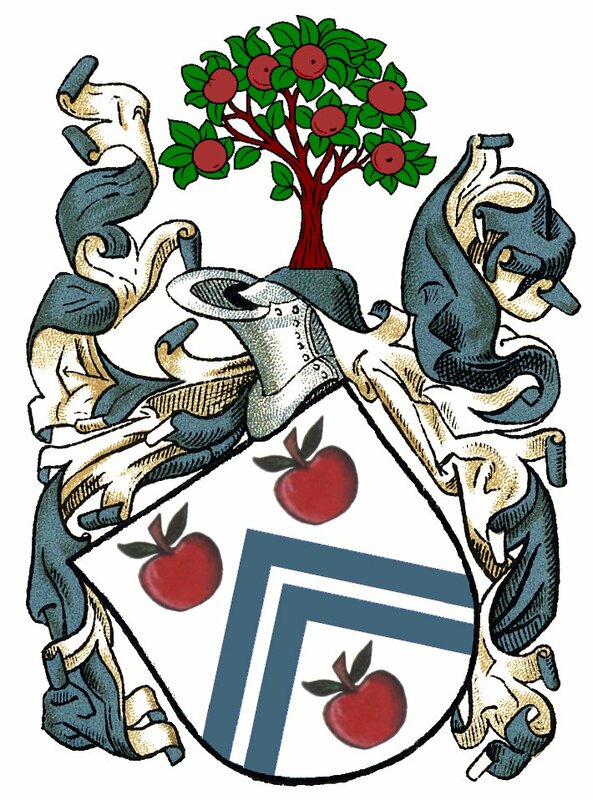 Unsurprisingly, given its wide use just about everywhere as an element of architectural design, the Royal Arms of Scotland. Also on display are two versions, one older, one newer (1995) of a variant of the arms of the City of Glasgow with the bird in the tree, the bell, and the fish with a ring in its mouth, along with the motto "Let Glasgow flourish". I always find it interesting to see how different artists will interpret the same shield, don't you? And finally, there was this double panel with two different Campbell arms with the well-known gyronny. 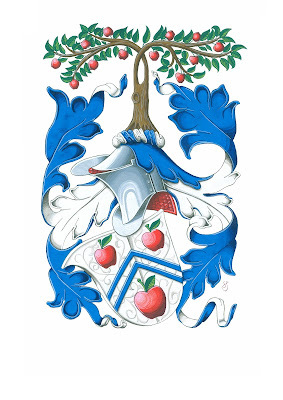 Presumably the lower shield shows the marriage of a Campbell with a branch of Stewart, with their fess checky. And thus we end our tour of Provand's Lordship in the St. Nicholas Garden and a little time with some famous Scots heraldry. Next time, we begin our tour of the Burrell Gallery and some of the heraldry that can be found therein. For our last item in the interior of Provand's Lordship, the oldest house in Glasgow (built in 1471), we ran across this relatively simple, but very nice, armorial wooden chest or box. While really pretty plain-looking, the carving of the square in the front with the coat of arms is very deep and - despite its relative simplicity - very well-carved, with a lot of delineation and visual interest. But what a great way to use a coat of arms! * Correspondence from our good friend Margaret Sainte Claire of Glasgow confirms that these are the arms of Muirhead of Lauchope. 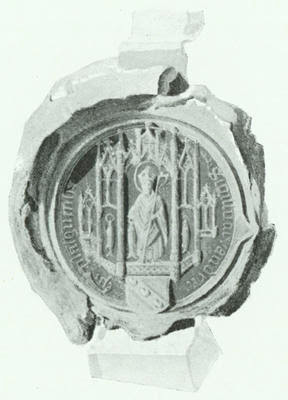 She forwarded a link (http://www.theglasgowstory.com/image/?inum=TGSA05012&t=2) that led to an illustration (below) of the arms of Andrew Muirhead, Bishop of Glasgow 1455-1473 at the bottom of his seal. Bishop Muirhead built Provand's Lordship in 1471, so this armorial box is entirely appropriate to the building. How cool is that? This blog, and you as reader, and I as a blogger, have reached a milestone. What I am writing, and what you are now reading, is my 1,000th blog post. I'm not sure I could have known when I wrote and published that first post more than eight years ago, on January 19, 2009 (http://blog.appletonstudios.com/2009/01/learning-curves.html), that I'd still be writing, or that you'd still be reading, it. I hope that, over the course of the past eight years and a little over four months, you have found it to be of interest and of use. I hope that at least some of the posts have been informative; I hope. also, that you have made some use of the links I have added (and continue to add to periodically). 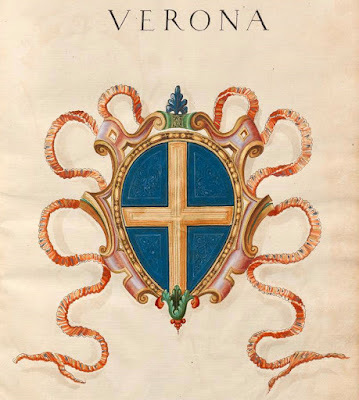 It was, and is, my desire that this blog could be a resource for people doing heraldic study and research. Oh, yeah, while I think of it; if you should happen to find any broken links in my links lists, please let me know. I don't usually have the time to do anything more than spot check them occasionally, and we all know how fickle the "intertubes" can be about having websites die out or change their URLs. So if you find a broken link, please let me know so I can keep the resources here up to date, either by changing to the new URL or removing it from my lists here. Anyway, the odometer is turning over at this blog post. We've done 1,000. Here's to many more! 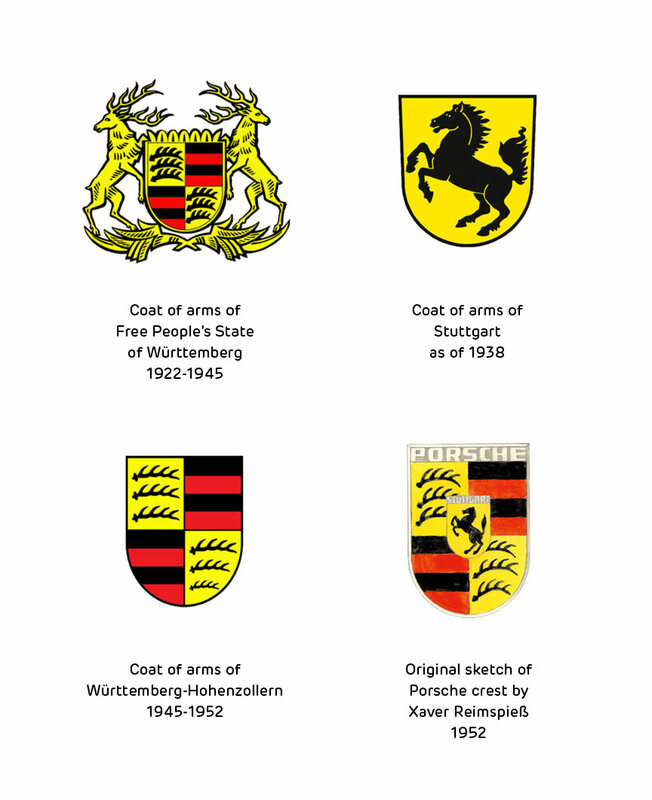 And now, to keep things focused on the titular topic of this blog, and for your heraldic viewing pleasure, here's a few renditions of my own coat of arms created by various heraldic artists (as well as a couple by myself) over the years. Enjoy, and I look forward to writing for you in the future! I had considered covering the second of these two items at a later date, but then the first item was brought to my attention very recently, and because they both touched on the same general topic, I felt I just had to say something now. That these arms are now used (with the change of the motto Integritas ["Integrity"] to "Trump" and the reduction in the number of tinctures) by The Trump Organization at Mar-a-Lago and the other resorts owned by The Trump Organization has set a number of people's teeth on edge, including the heralds at the College of Arms. 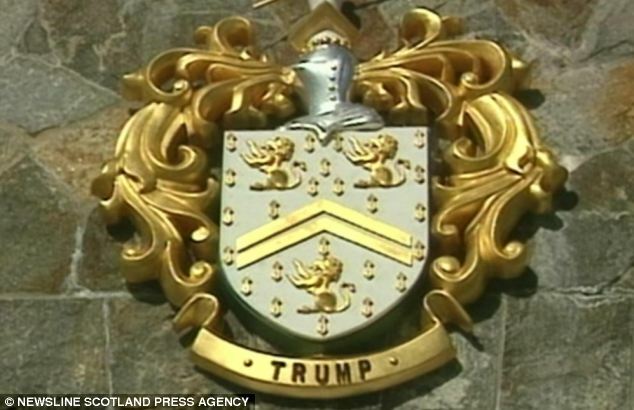 And since The Trump Organization has trademarked the logo here in the U.S., there is very little that the family can do about it.